(Lancaster, Pa., Feb. 20, 2019) - Veteran right-hander Jonathan Albaladejo will return for his second season in Lancaster and fourth campaign in the Atlantic League as a player/coach, it was announced today by manager Ross Peeples. In addition, catcher Anderson De La Rosa will be back for his third season behind the plate for the ‘Stormers. 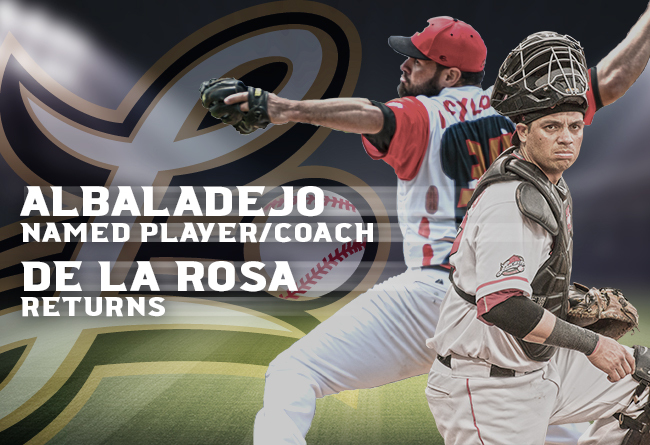 Albaladejo, 36, Went 9-7 with a 4.41 ERA for the Barnstormers in 2018. Over a club-leading 132.2 innings, the right-hander walked only 27 and struck out 104. He fired three complete games, all in seven-inning doubleheader contests, including a shutout against Southern Maryland on June 2. The Puerto Rico native fired 13 quality starts out of 23 for the club. He also pitched Lancaster to a 5-3 victory at New Britain on September 12, the night the Barnstormers would go on to clinch their first playoff spot in three seasons. In his one playoff start, the right-hander lost, 3-0, at Sugar Land in Game Three of the Division Series. Albaladejo allowed eight hits and two runs in seven innings. In two previous seasons in the Atlantic League, Albaladejo was a combined 22-12 for the Bridgeport Bluefish. He was the league’s Pitcher of the Year in 2016 with a 15-6 mark and a league-record 164 strikeouts. He appeared in a portion of five big league seasons with Washington, the Yankees and Arizona, posting a 6-3 record in 66 relief appearances. In 2010, Albaladejo led the International League with 43 saves while pitching for Scranton/Wilkes-Barre. De La Rosa, 34, is back for his third season as one of Lancaster’s receivers. The Venezuela native batted .255 with three homers, 24 doubles and 38 RBI over 91 games during the 2017 campaign. In 2018, he appeared in 72 games, hitting .229. The defensive specialist, entering his 15th professional season, has thrown out 35% of opposing base stealers in his career. Prior to coming to Lancaster, De La Rosa spent 10 seasons in the Milwaukee Brewers organization, reaching Class AAA Nashville. He also spent a season apiece with the Angels and Kansas City. The signings bring the number of players under contract for 2019 to 10.